Glazed tile floors technology has changed little over the centuries; clay is still shaped into a tile 3/4 inch thick or less, then fire-hardened. Because clay is naturally porous, finishing floor tiles with a matte or high-gloss glaze or sealant makes them more resistant to water. With a rainbow of colors and designs from delicate florals to contemporary geometrics, this flooring is at home in a variety of settings. Glazed floor tiles are generally rated for wear resistance by the Porcelain Enamel Institute (PEI), so make sure and inquire as to the rating of the tile you are purchasing. A rating of 5 for instance, would mean that this particular floor will wear better than one rated 3 or 4. 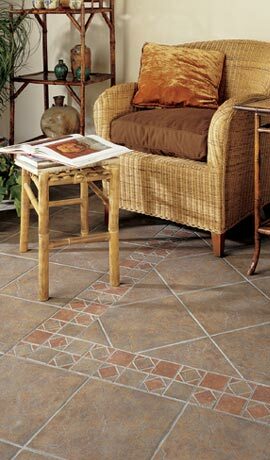 Glazed tile flooring is by far the most popular tile being purchased today. They are manufactured in countries such as Italy, Spain, Portugal, United States and many other places as well. Due to the number of manufacturers existing today, pricing has become a very competitive issue. Nonetheless, try and avoid those popular building material warehouses (you know who we mean) that advertise .50 SF tile. I can assure you, a good first quality tile will cost you from $1.50 per SF and higher. What you can expect for anything less is warpage, blemishes, lizard tail cracks (small wavy cracks in the glaze), mis-sized pieces, inferior bisque and glaze, etc... If these things appeal to you, then by all means buy it. However, if you are like most intelligent consumers, sacrificing quality for price is left for the foolhardy. Always remember this principle. The floor you are considering should by all intents and purposes last as well as look good forever. This principle will only apply if you exercise practical and prudent insight. In other words, try and follow the above advice.